We often think of bacteria as our enemies, as something we need to fight with antiseptics and antibiotics. While this may be true for certain rogue bacteria, like the ones that cause food poisoning or cholera, we actually live in harmony, and even rely on the rich bacterial communities that surround and inhabit us. Bacteria are essential parts of our environment, found in nearly every corner of the world where they break down dead organisms and make their resources available for new growth. Our own bodies also rely on a diverse collection of bacteria that live on every inch of our body: in our digestive system, on our skin and in our mouth. Gut bacteria break down difficult molecules in our diet and provide many essential cofactors and vitamins. In other parts of our body, they maintain healthy pH, simulate the immune system, and even help protect us from infection by pathogenic bacteria. Researchers at JCSG are using structural genomics to explore our symbiotic relationship the bacteria in our gut, including one of the most prevalent species: Bacteriodes thetaiotaomicron. This species and its relatives are important, among other things, for the digestion of complex carbohydrates in our diet. These bacteria make several hundred enzymes and transporters involved in carbohydrate metabolism, so they are well equipped for their task of breaking these into simpler sugars, for use by the bacterium and by us. This role is significant: a study showed that germ-free mice need to eat roughly 30% more food than mice that have a healthy crop of bacteria. The bacteria in our gut have developed a mutually-beneficial truce with their hosts after millennia of evolution. Researchers at JCSG are exploring the molecules that mediate this truce, looking at the diverse collection of proteins that are secreted by intestinal bacteria to protect themselves and gather the nutrients they need to live. This truce requires a delicate balance between our need to protect ourselves from life-threatening infection, and each bacterium's need to find a suitable niche to live. The recent structure of Bth-MACPF (membrane-attack complex/perforin) from the JCSG, shown here from PDB entry 3kk7, is opening new windows on the molecular mechanisms that mediate this truce. The structure revealed that it is similar to a class of defensive proteins that poke holes through cell membranes of pathogenic bacteria, such as human complement protein C8alpha. 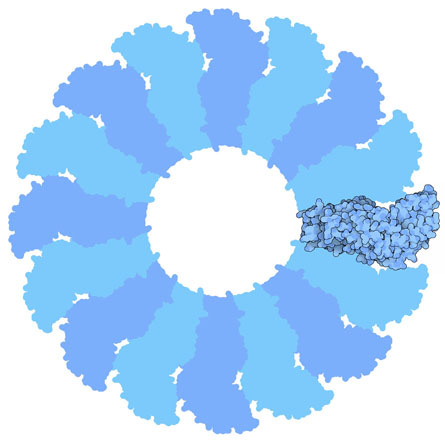 Using a tricky structural switch, the complement protein helps to form pores in bacterial membranes, and it is one of the mechanisms that we have to fight bacterial infection in our blood. You can click on the image below to explore the two structures in more detail. 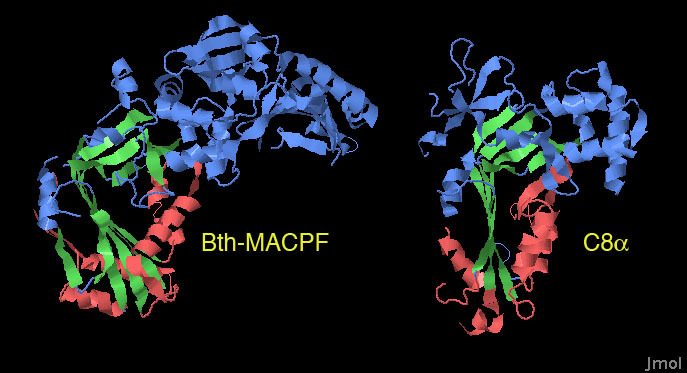 Two MACPF proteins are overlapped here: the MACPF from Bacteriodes thetaiotaomicron and the complement protein C8alpha. Both are built around a distinctive bent beta sheet, shown here in yellow, with two alpha-helical loops connecting the ends, shown here in red. In this compact form, the protein is soluble in water. 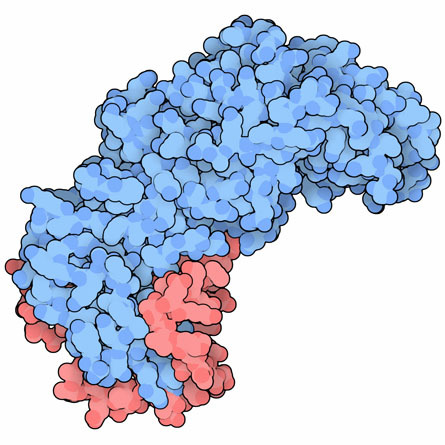 When it finds a cell surface, however, the two loops unfold and form long beta strands that insert into the membrane. Then, many of the proteins assemble to form a pore. The bacterial MACPF presumably forms similar pores, based on the similarity to our pore-forming molecules. However, the function of the bacterial MACPF pore is still a mystery. It doesn't seem to attack our own cells; our cell membranes are much more complex than bacterial cell membranes, and besides, that would break the truce and flag the bacterium as a pathogen. JCSG researchers have come up with a few ideas for how it might function in a less aggressive way: it may be used for transport of molecules across cell membranes, or as part of a defense against pathogenic bacteria, or even as a method to disarm our own defensive pore-forming molecules. Xu, Q., et al. Structure of a membrane-attack complex/perforin (MACPF) family protein from the human gut symbiont Bacteriodes thetaiotaomicron. Acta Cryst. F66, 1297-1305 (2010). Hadders, M. A., Beringer, D. X. & Gros, P. Structure of C8alpha-MACPF reveals mechanism of membrane attack in complement immune defense. Science 317, 1552-1554 (2007). Zocco, M. A., Ainora, M. E., Gasbarrini, G. & Gasbarrini, A. Bacteriodes thetaiotaomicron in the gut: molecular aspects of their interaction. Digestive Liver Disease 39, 707-712 (2007). Comstock, L. E. & Coyne, M. J. Bacteriodes thetaiotaomicron: a dynamic, niche- adapted human symbiont. BioEssays 25, 926-929 (2003).